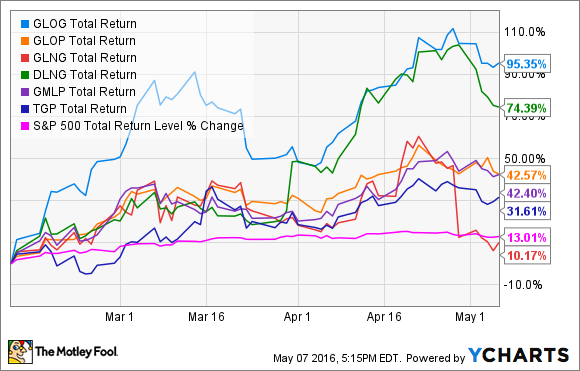 Find out which of these fasting growing, high-yield dividend stocks are worth the hype. The stock market can be volatile at times, especially with high-yield LNG tanker stocks such as GasLog (NYSE: GLOG) and Golar LNG (NASDAQ: GLNG); their respective MLPs, GasLog Partners (NYSE: GLOP), Golar LNG Partners (NASDAQ: GMLP); and two other LNG MLPs, Dynagas LNG Partners (NYSE: DLNG) and Teekay LNG Partners (NYSE: TGP). Naturally, it can be difficult for dividend investors to determine whether any or all of these recent price fluctuations are justified. Even harder is determining which of these LNG tanker stocks, if any, are likely to make good long-term investments. However, such a task is not impossible. As we shall soon see, there are several reasons why half of these six are currently worth owning. At first glance, the recent rally in LNG tanker stocks makes little sense. After all, other than Golar LNG, which has 65% of its fleet operating in the short-term spot market, all of these stocks derive their cash flows from long-term, fixed-fee contracts that have to do with the transportation of natural gas. Thus, a rally in oil prices wouldn't seem to benefit them much, if at all. However, this isn't necessarily true. For one thing, low oil prices have had oil companies slashing expenses, and LNG export projects are immensely costly and take many years to bring online. Thus, it's possible that cash flow-desperate oil companies may end up cancelling LNG export projects out of necessity, potentially reducing demand for LNG tankers. In addition, many LNG contracts in major LNG import markets -- Asia and Europe -- are linked to oil prices. 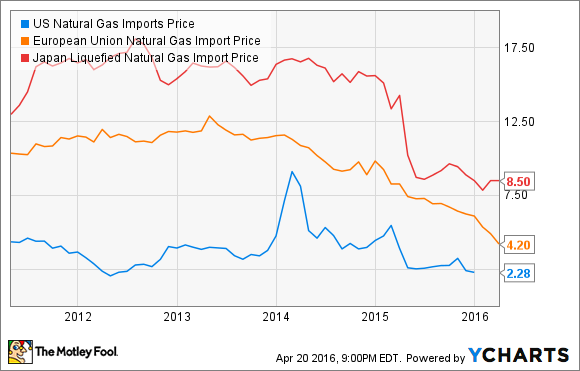 As crude prices have collapsed, the price advantage of importing U.S. natural gas has plummeted as well. Sources: Yahoo! Finance, Fastgraphs, Morningstar, company 10-Ks, management guidance. Note that Golar LNG generated negative free cash flow, as well as a large GAAP loss in its latest quarter. It also slashed its dividend 89% this quarter. It's suffering from heavy exposure to short-term tanker pricing, which has been depressed over the past few years because of vessel oversupply. Meanwhile, Teekay LNG Partners recently cut its distribution 80%, which explains the sky-high distribution coverage ratio. The cut was necessary because of its heavy debt load and the large amount of contracted expenses it has coming due over the next few years, mostly new tanker construction. Finally, remember to be skeptical of payout growth projections, since they're only estimates, whether coming from management or analysts. Dividend investors should prioritize long-term sustainability of a payout -- which requires a solid distribution coverage ratio. GasLog, GasLog Partners, Golar LNG Partners, and Dynagas LNG Partners all seem to have reasonably secure payouts for the time being. While this situation makes short-term distribution cuts less likely, it doesn't necessarily guarantee their current dividend payemtns. That's because payout sustainability can be wrecked by an over-leveraged balance sheet. The LNG Tanker business is a capital intensive one, so a great deal of debt is to be expected. However, GasLog has an enormous leverage ratio, as well as nearly $1.5 billion in obligations coming due relatively soon. This makes me skeptical of the long-term sustainability of its dividend, despite its recent move to refinance all debt maturing between now and FY 2017. Teekay LNG Partners has a similar problem -- high debt and huge obligations on its distributable cash flow. Meanwhile, GasLog Partners and Dynagas LNG Partners also have relatively high leverage ratios -- rating agencies usually like to see no higher than 4.5 -- but their ratios are still probably small enough to prove manageable. In addition, their small short-term capital obligations mean that, should energy prices not recover by 2018, neither would, most likely, have to take on additional debt. It seems increasingly likely that we are on the cusp of increased LNG trade growth over the coming decades. However, dividend investors wanting to cash in on this trend need to be careful that their LNG tanker stocks all have long-term contracts, well-covered payouts, and manageable debt and short-term capital obligations. Possessing all three characteristics, Golar LNG Partners, GasLog Partners, and Dynagas LNG Partners, represent the best long-term income opportunities in this industry.